Robust cable junction box for terminating vented electrical cable from a 2 wire submersible hydrostatic level transmitter. The inside of the IP66 sealed box is vented to outside air via a PTFE filter to ensure the level sensor is properly vented to compensate for atmospheric pressure. The KL1 enclosure is made from a die cast aluminium with a grey powder coating. The internal environment is sealed to IP66 to prevent dust or moisture ingress. A PTFE filter pressure balance is incorporated into the enclosure wall to provide a vent path for the submersible sensor cable. Two M16 x 1.5 polyamide cable glands with NBR seals are fitted to the underside of the termination box to provide strain relief and an IP68 seal for the cable entry of the over-ground and submersible sensor cable. The wires are terminated inside via vertical screw clamps which can accommodate wire with diameters up to 2.5mm2. 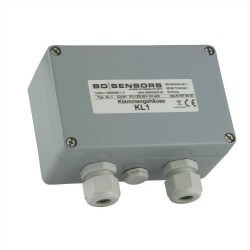 In addition to providing a junction for a 2 wire 4-20mA output signal from a submersible borehole level sensor the KL1 termination box also has the options for including a PT100 transmitter and over-voltage discharge protection to 10 kiloamps related to nearby lightning strikes. What is the vented cable jct box used for? The junction box is for terminating the signal cable from a submersible gauge reference pressure sensor. Typically the junction box is installed at the top of a borehole or water well and the sensor cable is terminated inside. Some junction boxes include over-voltage protection or lightning protection circuitry to protect the instrumentation from voltage surge overload. The main purpose of the junction box is to provide a dry environment for the sensor cable vent tube. It is important the vent tube to be open to atmospheric pressure without the allowing moisture to contaminate the interior of the sensor. The junction box has the added benefit of minimising the length of submersible sensor cable which is much more expensive than general purpose sensor cable that is not vented. Please select the options you require for the KL1 Cable Junction Box for Submersible Level Transmitters in your application and request a quote. Send us your enquiry for KL1 Cable Junction Box for Submersible Level Transmitters to get assistance with this product type.